In case you’ve been hiding under a rock, the Dow Jones Industrial Average reached 20,000 earlier this week for the first time in its 132 year history to much media fanfare. Since Trump’s election US market indicators, including the Dow have been ticking up – it has been labelled the Trump rally. This latest milestone is something that the new President is happy to take credit for. In fact, he tweeted ‘Great! #Dow20K’ in response. Few commentators pointed out that this latest ‘bubblelicious’ Dow milestone of 20K comes at a time when the U.S. is drowning in a sea of red debt as debt levels continue to surge and will reach the even more important milestone of $20,000,000,000,000 (trillion) in the coming weeks. The digit two is in both and both have a lot of zeros but the latter is actually much more important than the former. In value terms, the 20,000 milestone means very little. In fact, in real value terms (when priced in gold) the Dow isn’t much higher than when it first hit just 1,000 back in 1972. The Dow has had an impressive performance since November 8th, it has climbed around 9.5%. The actions of Trump since both his election and inauguration (from tweets to signing Executive Orders) have driven positive market reactions … so far. There is little doubt that since his inauguration the new President has worked hard to show that he will make good on his election promises. All of which come under the umbrella to ‘Make America Great Again.’ In turn, market activity does show signs of what Keynes would have called ‘animal spirits’ – the self-feeding frenzy in markets when confidence is high. As a result, it appears US markets are doing well and so the DJIA reaches a new all-time high in nominal dollar terms. But, as we have learnt from both Obama’s administration and all the others before that, there is a serious falsehood in claiming new records in markets really mean something, particularly when you are basing your information on an already flawed monetary system involving the increasingly debased currency that is the dollar, not too mention currencies internationally which are all being debased. The Dow has been on a winning streak since 2009, in the period of Obama’s two term presidency the index climbed 144%, the S&P 500 172% and the Nasdaq Composite 275%. No-one can claim that this was all thanks to the Obama administration and some argue that it is not a reflection of what the 44th President really did for the economy given the actions of central banks both at home and abroad – involving QE on an unprecedented scale and an unprecedented monetary experiment in zero percent and negative interest rates. It is worth noting that Venezuela and previously Zimbabwe had the best performing stocks markets in recent years. In fact, whilst Trump will be keen to beat Obama’s stock market performance figures, he was a vocal critic of the ‘falsehoods’ upon which his predecessor based his economic KPIs on. We wonder if Trump will remember this when he continues to publish self-congratulatory tweets about the DJIA’s success. For a start, the Dow Jones Industrial Average is an odd measure for a economy’s success. There are hundreds of publicly traded companies in the United States, but the DJIA only considers 30 of them. There is no clear reason why it includes those particular 30 and their performance is calculated using the Dow Divisor (which is currently 0.14602128057775). Trump is celebrating something that has come about in the face of what he called ‘a false economy.’ An economy, that he inherited from Obama and continues to benefit from – the economy that has been pumped up by the Federal Reserve including a massive increase in public and national debt. When you look at the DJIA against something that has held its value, as opposed to the debased dollar and the artificially stimulated US economy, then you will see a different story. 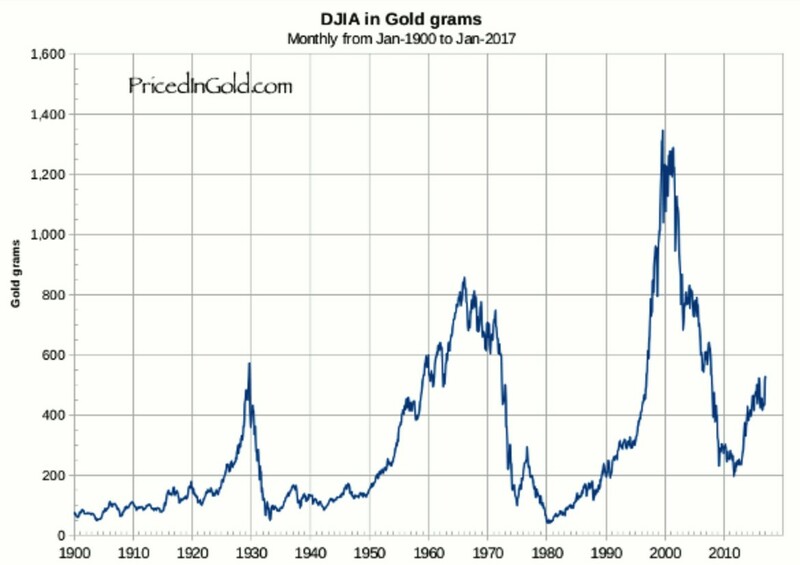 ‘Sir Charles’ over at pricedingold.com, draws our attention to the fact that the Dow priced in gold is nowhere near its high of 1110 grams of gold (49 oz) seen in 1999 when the DJIA rose to a record of 11,700 and gold was at a record low of $240 per ounce (see chart). Last Friday, when Trump was inaugurated the Dow was at 530g (18.1 oz). Breaking through 20,000 is clearly an important psychological level for traders and markets, as it was in 1972 when it reached 1,000, then 5,000 in 1995 and 10,000 in 1999 and 15,000 in 2013. The difference though from the first big milestone in 1972 and today is that much of that was driven by a real economy, real company profits and real economic growth. It wasn’t until 1973 that the strings began to unravel and both the dollar and stock market began to fall, the Dow reached its all-time low of 37g (1.3oz) in 1980. Were that to happen today with the DJIA at 20,000, we would need to see gold prices surge to $15,384 per ounce. The answer to this question lies with Donald Trump. As we have explained already, whilst the recent highs in the DJIA might not mean much in real-terms, it is an important indicator of the high expectations traders have for Trump and his radical policies – at least in the short term anyway. This is a President who has won an election on promises to grow a real economy and to bring it back to its former glory days, this surely means a currency that is worth something. For all of Trump’s comments on the Fed during the election campaign and complaints about the strong dollar in the run-up to the inauguration, he actually hasn’t done much to reassure us that he is aware of how to fix the financial system. Instead, he talks about the strong dollar in relation to its exchange rate with another currency, not in terms of its real value. For Trump the solution appears to lie in protectionism, which just seems to be a way of papering over very odgy vulnerable and cracked foundations. Economics and the Triffin Dilemma tells us that Trump can’t have his cake and eat it – there is an incompatibility between the domestic policy of a country (which operates a global reserve currency) and the international monetary order. Instead, the solution may lie in real monetary reform. Something his recent pronouncements and cabinet appointees strongly suggest will not take place. During the Republican nomination rounds, there was plenty of talk about the value of the dollar and how it could be reformed to some of its past glory through the gold-standard. Since Trump’s nomination, this has not been mentioned again. From a Libertarian perspective, he is proving himself very disappointing indeed. Both in terms of economic and monetary policies and indeed in terms of his expansionist, some would say quasi-imperialist foreign policies. If Trump really wants a reason to fist pump on social media, and show that he is bringing real value to the US economy, he would have to begin to focus on honest money and basing his monetary policies on something of real value – gold. So far there is little sign of this – quite the opposite as his fiscal policies are wildly expansionary and this needs to be paid for by the already massively indebted U.S. sovereign. Who is going to carry this reform for Mr. Trump? He has an early chance to nominate two governors of the Federal Reserve and, before long, to replace the chairman and vice chairman. These choices will be important. Mr. Trump’s nominee as Treasury Secretary, Steve Mnuchin, seems lukewarm or even indifferent to the cause of honest money. Vice President Pence, however, gets it down to the ground. We’ve already suggested Senator Cruz as the next Fed chairman. A return to the gold standard may seem a way off, but if Trump’s presidency continues to be as radical as it initially appears it is not impossible to imagine monetary reform happening. However, it may be that necessity rather than prudence forces the President’s hand. Given the scale of U.S. debt, a dollar crisis seems increasingly likely. The new President may then be forced to look to gold as a way to restore confidence in a battered greenback. Conclusion – Dollar ‘great’ Or Dollar Crisis? Trump so far appears to be exacerbating and accelerating financial, monetary and geo-political trends that were already taking place. What was happening slowly and almost imperceptibly under Bush II and Obama is now becoming more apparent and intensifying under Trump. Wars are very expensive things to wage and have to be financed. Today they are being financed by stealth currency devaluation. Will Trump accelerate the decline and devaluation of the US dollar during his Presidency? Or will he make the dollar “great again” and restore the greenback to its former glory? The signs in the first few days of his Presidency are not good, underlining once again the importance of owning physical gold to protect against geo-political risks, stock and bond market bubbles and the continuing devaluation of all fiat currencies.